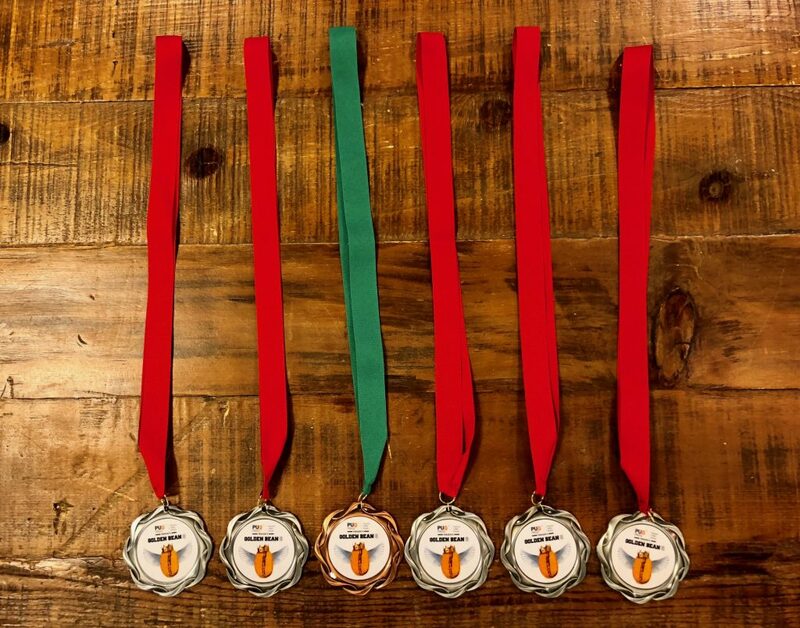 Crimson Cup brought home six medals from the fourth annual Golden Bean North America roasting competition. Competing in a field of over 900 entries from 500 roasters, our Wayfarer Blend, our Ethiopian Kossa Kebena, Tired Goat Blend, 1959 Colombia Mokka and Oxapampa Peru Gesha coffees brought home silver medals. Wayfarer Blend also won a bronze medal. Our entries were sourced and selected for Golden Bean judges by Coffee Sourcing and Education Director Brandon Bir, who also served as one of five category judges at the competition. The contest took place Sept. 19 through Sept. 22 at the Double Tree by Hilton hotel in Portland, Oregon. Crimson Cup was named 2016 Macro Roaster of the Year by Roast magazine. Our Ethiopian Kossa Kebena coffee won a 2017 Good Food Award, and our Wayfarer Blend has brought home trophies from the America’s Best Espresso competitions at Coffee Fest New York and Coffee Fest Chicago as well as the 2016 and 2017 Golden Bean North America competitions. At the Golden Bean contest, coffees in 10 different categories and brew methods were judged through blind tasting by roasters attending the event. Crimson Cup won medals in all five categories that we entered. Two new coffees – Café 1959 Colombian Mokka and Oxapampa Peru Gesha – both won silver medals in the Franchise/Chain Filter category. Crimson Cup sourced the coffees through its Friend2Farmer direct trade program. Brandon discovered Oxapampa Gesha coffee through NARSA (NEGOCIACIONES AGROINDUSTRIAL AREVALO S. A. ), a private co-op founded by Don Julio Abel Arevalo Tello that assists Peruvian small-plot coffee farmers in marketing their coffee. Farmer Hector Portocarrero grows the coffee at elevations of 1,750 meters. This cherry-dried coffee has tasting notes of tropical fruit, watermelon, and pomegranate. The award-winning Wayfarer Blend, Ethiopian Kossa Kebena and Tired Goat Blend coffees are available at Crimson Cup Coffee Houses in Columbus and Tallmadge, Ohio. Both Café 1959 Colombian Mokka and Oxapampa Peru Gesha coffees will be featured on the coffeehouse brew bars in the coming weeks.